This month, Death Cab for Cutie’s guitarist and producer Chris Walla will be releasing his first solo LP on Barsuk Records. Some die hard Death Cab fans may remember some solo songs featured on cassette and others under Martin Youth Auxiliary, but Field Manual marks his first “official” release of sorts. 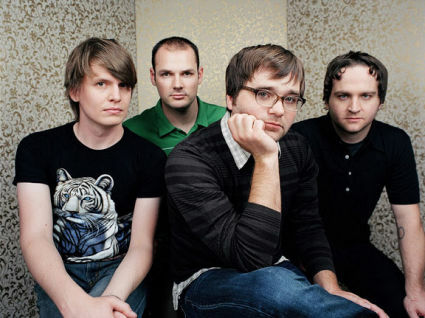 In May, Death Cab for Cutie will release their 6th studio album. The record sounds like it’s going to be one of my favourite Death Cab albums, based on all the news and interviews about it. The words loud and weird are being thrown around. Ben Gibbard spent time at the “Big Sur” cabin writing songs for the new album, where author Jack Kerouac spent time to wind down, so it should make for an interesting listen with the possible return of the “Barsuk Mens Choir”? – Ben Gibbard acting in Brief Interview with Hideous Men, written and directed by The Office’s John Krasinski. – Ben Gibbard guesting on the new Nada Surf album Let Go. – A possible Postal Service album late this year, but I’m going to guess next year. Such a hipster comment….what is this blog coming to? You used to be about the music. how can you give the new album a positive review before you’ve even heard it? but thanks for the other updates, those are sweet. I havn’t really gave it a review… Just saying that from all the news growing around it, this album sounds like it’s gunna be something I’m really going to enjoy. and another update i forgot, the new So Many Dynamos record is produced by Chris Walla as well.